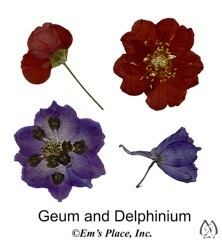 Digital pressed geum and delphinium flowers enhances your arrangements. Create your own unique arrangement with these beautiful flowers. File comes zipped and in a .psd file format with all the layers included. You will need a program that can open these file formats - see our video about how to do this. For personal use only - please refer to the digital use policy page. No shipping/handling will be incurred for digital download items and watermark on large image will not be included.